At The Vision Show 2016 collaborative robots and ease of use stand out as the leading trends of this year’s show and conference sessions. A Collaborative Robot Workshop was co-located with The Vision Show and was a combined effort of The Robotics Industries Association (RIA), Mass Technology Leadership Council and its hub for robotics, MassRobotics. 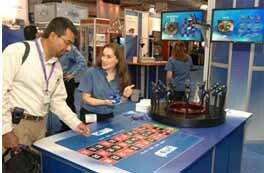 Attended by over 200 people, the workshop drew new attendees to The Vision Show, which featured a special “Collaborative Applications” section on the show floor. When speaking to Jeff Burstein, President of the Association for Advancing Automation, organizers of The Vision Show, and he noted the increased interest in collaborative robots, which work side by side with people. “The US is using a record number of robots.” He said it’s always been a misnomer that robots replace people. “In fact, where roots are used, unemployment has fallen.” He added that companies are investing in retooling and there’s a strong interest in collaborative robots with vision, and this is clear both in the collaborative robot workshop and on The Vision Show floor. Xenics is a good example of a company that serves a myriad of markets. It offers infrared imagers and cameras that find a home in applications ranging from spectroscopy and microscopy to defense and security to harsh industrial manufacturing environments. In addition, the company’s lightweight imagers are being used on UAVs in agricultural applications. Design Assistant from Matrox emphasizes ease of use for those designing vision systems. This flowchart-based integrated development environment lets you design machine vision applications just by creating a flowchart, rather than through traditional programming. Basler’s PowerPack for Microscopy allows the end user, whether it’s a teacher, a lab professional, doctor or manager on a factory floor, to set up a complete system by picking the camera they need, following a quick installation guide, and using the professional microscopy software for camera control, image acquisition, processing and analysis. Teledyne Dalsa’s Calibir is an uncooled long-wave infrared (LWIR) shutterless camera platform that is only 29mm x 29mm, small enough to be integrated into the industrial production line. It comes with easy to use software that anyone can use to get images up and running. Universal Robots was showing a tabletop robot that could be programmed by anyone. By simply holding a tablet and moving the robot to desired waypoints, the robot’s movement can be programmed. The robots can be fitted with vision systems from a variety of manufacturers, providing 3D visualization and more. And while the tools are being designed for use by those with little or no vision training, the AIA is placing increased emphasis on certification for integrators and vision professionals. Basic and Advanced Certified Vision Professional (CVP) courses can be taken in person or online, with the corresponding exams taken at designated AIA testing locations. New at The Vision Show 2016 was the startup competition. The winner, Brohan, was awarded $10,000 in prize money. Brohan specializes in computer vision-assisted naïve advertising for video and VR. The software identifies surfaces inside video and VR content that can house advertisements, then matches those spaces with ads. The Vision Show 2016 drew more visitors and exhibitors than in previous years—an indication of not only the strength of the industry, but of the critical role that vision plays across all industries. The 2018 Vision Show takes place again at the Hynes Convention Center in Boston, Massachusetts (US).